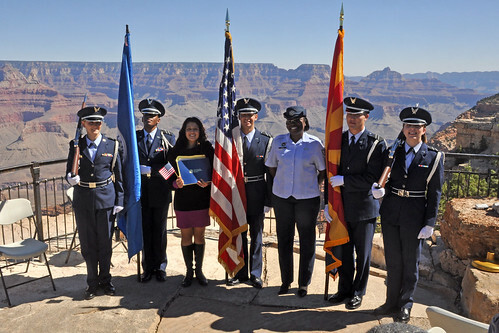 The Air Force ROTC Honor Guard of Northern Arizona University poses with a new citizen. On Thursday, September 23, Grand Canyon National Park in coordination with The Department of Homeland Security, hosted a naturalization ceremony at the Mather Amphitheater on the South Rim. This is the first time in history that Grand Canyon National Park has hosted such an event.. Under blue skies and before a breathtaking view, 23 individuals from 12 different countries including, Colombia, Dominican Republic, Guatemala, Japan, Mexico, Morocco, Australia, Trinidad and Tobago, Uruguay, Venezuela, Vietnam and Zambia, became naturalized citizens. Many family members and close friends of the candidates came to show their support for this special event. Park employees and visitors also watched on as the candidates stated the Oath of Allegiance, and received their certificates of naturalization. .
Deputy Superintendent Palma Wilson welcomed the candidates and their families. The Presentation of Colors was done by the Air Force ROTC Honor Guard of Northern Arizona University. John M. Ramirez, Acting District Director for the U.S. Citizenship and Immigration Services (USCIS) administered the Oath of Allegiance to America's newest citizens. A keynote address was given by USCIS Ombudsman January Contreras. Ms. Contreras stated, “Everyday, we welcome new and diverse stories and heritages into the great patchwork of our Nation. United by our devotion to the Constitution and to the civic engagement it inspires, Americans remain committed to the fundamental principles established over two hundred years ago.”. This event is part of USCIS’s annual celebration of Constitution Day and Citizenship Day. An estimated 9,258 candidates will become citizens at 63 special ceremonies held across the country and around the world from Sept. 13-24..